Brighty, a shaggy young burro, lives wild and free in the Grand Canyon of Arizona. He roams the steep cliffs with the squirrels and rabbits. But his favorite friend is Old Timer, the prospector who shares hot biscuits and calls him Bright Angel. One day Old Timer doesn't answer Brighty's loud "Eeeee-aw!" Instead, the friendly animal encounters a ruthless claim jumper. Will Brighty be able to bring the killer to justice and make the wilderness safe again? 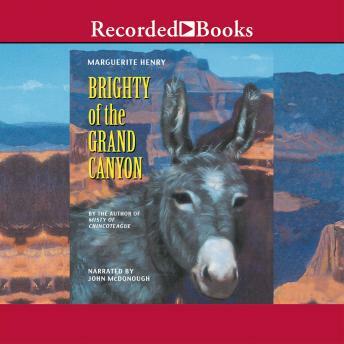 Marguerite Henry, author of the Newbery Award-winning classic Misty of Chincoteague, Based this delightful story on the adventures of a real-life Grand Canyon burro. Brighty touched the hearts of all who knew him -even President Teddy Roosevelt. John McDonough's animated performance brings out the burro's joyous free spirit and courageous determination.